This website serves as my portfolio for you to view samples of the services I can provide for your business. Generally speaking, I will field measure and provide computer-based layout drawings for Interior Designers in both PDF and DWG formats. I will provide in-scale furniture and lighting plans, window and wall elevations, flooring and tile installation drawings, space planning options, etc. displayed with your custom logo. Builders and other trades also benefit by having proper renovation drawings for organizing and also for permit applications. Fees are assessed at a free-lance hourly rate. For over eighteen years I have been creating 2D Autocad(c) drawings for several noted Interior Designers in Northern NJ and have been a user of Autocad(c) and computers for over twenty-five years. I have graduated with honors from both Architectural and Mechanical schools of drafting. I have hands-on experience in the fields of residential construction, manufacturing, food service, security and others. Designers utilize my CAD work for any size projects, from single rooms through complete home designs. I also draft interiors on commercial, hospitality, country club and medical jobs. I design mill work and am familiar with requirements for ADA compliance. I can acquire my own measurements or work with architectural drawings. You can send me a rough scan of an advertising print showing the layout of a townhouse or a camera phone picture of measurements you took on site. My experience allows me to infer scales and sizes from the most nebulous of data sources. How will you benefit from hiring me? Having a complete, well thought-out plan and a true in-scale representation of your goals allows you to feel confident that you are receiving accurate bids and are working with information that won't have any surprises. You will feel secure because you have an intelligent and organized person tying up all those loose ends and taking a personal interest in the successful completion of your project. You will increase your income by adding my skills to yours, which will allow you to take on larger and more diverse work offers. Before I start work on any project, we will discuss the depth and type of information required to accomplish your expectations. This minimizes expenses because time won't be wasted on superfluous information. Then I can take your design sketches and show your ideas in the drawing, along with any other necessary details. Or you can take the existing conditions and use them as you see fit. Please note that even though I understand the limitations and methods of construction I do not possess an Architect's seal. The town in which you are working will determine if you need an Architect's approval of any structural or site related modifications. 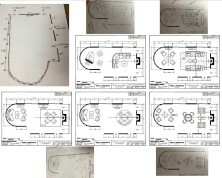 Here are some letter-sized (8.5"x11") floor plans made from cell phone pictures of sketches from the designer. The designer takes the measures, sketches them out and emails me a picture of them. I make a blank floor plan (in-scale with custom titles) and email back a PDF file. The designer prints the plan, sketches their designs on it and emails the new pictures back to me. 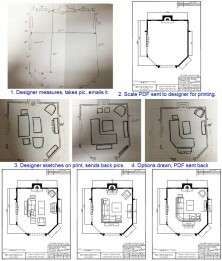 I then add the furniture and send back a PDF containing the presentation drawings. The time charged is usually 1 or 2 hours for these types. My fee is $30 an hour. I can also create scale jpegs for those who use programs that add the fabrics/coverings, etc. These further examples hopefully display my abilities and the range of methods possible. All samples are entirely my draft work. Click on the thumbnail to view the full-size PDF file. You can also right-click and "save link as" if you prefer not to use the online viewer. Allow me to present a man's private office and also an elegant master bedroom. The third sample is a partial house cross-section showing new trim embellishments. I took all the field measurements and made the drawings shown. Interior designers provided the concepts, furniture and specific trims. Here's an example of a two-story, three bed home that took only one day to measure and draw all three pages of existing conditions. It was a straightforward setup, every room had the same trims and things went very smoothly. The designer limited the scope of work to floor plans for new furniture placement, electrical on first floor only, and elevations of just the window walls. Displayed are samples of single room jobs. All plans, elevations and details are contained on one page. Expenses are always considered and I am as efficient as possible. Many designers like to have option drawings showing multiple furniture layouts or carpet sizes. Easily done. When possible I also provide drawings in standard letter size format to avoid special printing needs. Exhibited are some large floor plans. The first is the main level of a private residence, the second is a commercial location that was moving a tenant to a new area and expanding into the first area. All lighting, flooring, furniture, construction and demolition drawings were provided as needed to accommodate the move. In order to maintain printing costs I only make as many pages as needed to convey the information clearly. The third sample is a medical office which required four complete plans to be coherent. Examples of functional designed millwork. The first is my illustrated instructions for building the sub-structure for a two-level coffer wall system containing sliding doors. While it was not my own artistic concept, I facilitated the dialogue that allowed this structure to be properly executed. The second is my complete mill work design which needed to fit an existing stone fireplace and meet client specifications. Third is a set of elevations that the designer specifically designated for detailing. All information taken from the Architect's drawing file. No site visit needed. Tile work and bathrooms. See it, love it, embrace it! The historic Blairsden Estate in Peapack-Gladstone NJ. For the Mansions in May 2014 benefit. Last updated November 13, 2016. Page designed and created by me. All materials contained on this page are copyrighted.